The Nexus 4 officially did not have LTE support, tough people found a way to enable the hidden 4G connectivity. That didn’t work too well, but recently we’ve been seeing rumors that a Nexus 4 LTE is in the works. A Bluetooth certification just confirmed those rumors. The designs were submitted on October 24 (this Thursday) and were listed on the 25th (Friday). 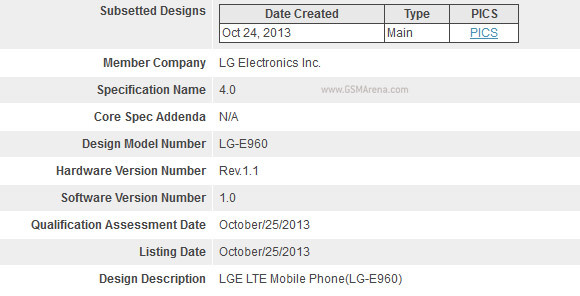 The Design model number is listed as LG-E960 (that’s the model number for the Nexus 4) but the Design description calls the device “LGE LTE Mobile Phone(LG-E960)”. The listing is linked to the listing for the E960 but also linked to the one LG-D821, which is the model number of the upcoming Nexus 5 (confirmed by a leaked manual). According to rumors, the Nexus 5 will cost $400 for the base 16GB model, while the Nexus 4 LTE (16GB) will be a cheaper alternative at $300. The current 16GB Nexus 4 is $250. Can our nexus 4 do a software update to use LTE ? Coz it hav all d hardware it need to use LTE right. As a Nexus 4 user, I am pleased, as a person looking forwards in terms of progress and value, I am disappointed. I was hoping for a $329 or $349 nexus 5, being nearly as cheap as the nexus 4, while still improving.